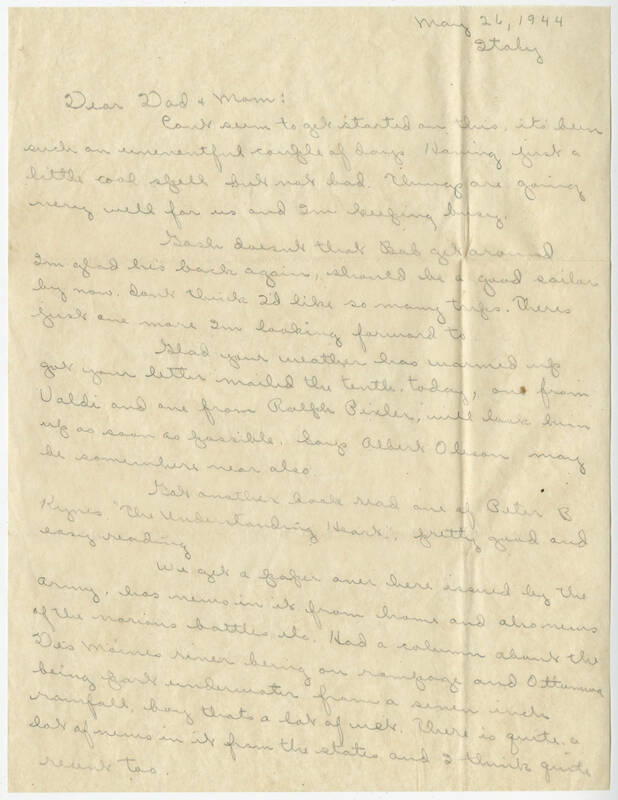 May 26, 1944 Italy Dear Dad & Mom: Can't seem to get started on this, it's been such an uneventful couple of days. Having just a little cool spell but not bad. Things are going very well for us and I'm keeping busy. Gosh doesn't that Bob get around. I'm glad he's back again, should be a good sailor by now. don't think I'd like so many trips. There's just one more I'm looking forward to. Glad your weather has warmed up got your letter mailed the tenth. today, one from Valdi and one from Ralph Pixler, will look him up as soon as possible. Says Albert Olison may be somewhere near also. Got another book read one of Peter B. Kynes, "The Understanding Heart," pretty good and easy reading. We get a paper over here issued by the army, has news in it from home and also news of the various battles etc. Had a column about the Des Moines river being on rampage and Ottaumwa being part underwater from a seven inch rainfall, boy thats a lot of wet. There is quite a lot of news in it from the states and I think quite recent too.